Colin M. Murray is the owner of Solution Control Services, a sole proprietorship offering a wide range of services from the control of commercial HVAC systems to industrial automation. Projects range from prototype and testing machines, control panels for custom HVAC manufacturers, industrial safety and motion control, full building and real estate portfolio integration, and user interface and graphics development on multiple platforms. Products supported include Tridium products from Vykon, Johnson Controls, Phoenix Contact, Honeywell, KMC, Johnson Controls Metasys (including all current and legacy platforms), GE Cimplicity, iFix and Intellusion, Rockwell Automation (all Logix Platforms), Factorytalk Studio, and Connected Components Workbench. Services also include configuring and installing user workstations, servers, and web supervisors. Virtualization is provided with either VMWare ESXi Hypervisor or Workstation. Solution Control Services is a Dell EMC Partner. Murray: Being an integrator began for me in the trades or maybe before with my Commodore VIC-20. I trained in Canada to be a refrigeration mechanic servicing the petrochemical industry and have worked in the field for all 27 years of my career. During that time, I began to understand the important relationship between automation, integration and complex mechanical systems. 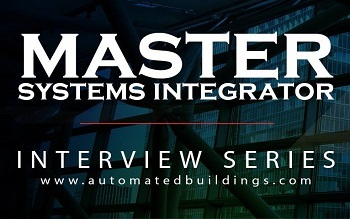 As automation became more prevalent, my work and interest were drawn more towards controls and integration. I became a service manager for a commercial HVAC company in 1995. From there I moved into larger contracting houses to gain more exposure to newer technologies. In 2003, I launched my own business with a focus on custom applications and supporting mechanical contractors who did not want to employ a full-time controls staff. Over the course of the last 15 years, I’ve had the opportunity to: develop controls for OEMs, build prototype machines for companies including Detroit Diesel and GM, and travel internationally to work on a wide variety of systems. This exposure not only provided rich and challenging experiences but offered a template to meet the most rigorous of customer expectations. Seeing the work of highly accomplished tradespeople, programmers and engineers across many disciplines forced me to reevaluate my standards and strive always to make each job an improvement on the last. Murray: An MSI must have a fundamental understanding of systems being controlled. This is necessary to ensure that integrators can validate information and correctly visualize systems. An understanding of both current and legacy control systems and communications protocols is also necessary. Most importantly, a willingness to learn and persist until a resolution is found is essential for an MSI. You must be willing to dig for answers as they don’t usually present themselves at the outset of an issue. Murray: I have had the good fortune of having all my job opportunities referred through colleagues, customers, and vendors. Murray: My customers tend to be contractors or end users who have been referred to me by their mechanical contractor. Murray: I think that being an integrator is all about overcoming challenges in an industry that is constantly growing and changing. The most common challenges include ever-increasing security constraints, browser, and platform compatibility issues, product anomalies from hardware issues to software glitches, and trying to keep pace with current user interface standards made popular in mass-market apps. These challenges are compounded by the goal of Internet-inclusiveness and the tsunami of information and standards that flow with it. The challenge is to stay afloat and not get swept away or be overcome. Murray: Yes. This industry and many others are pushing to integrate systems, visualize data and improve the user’s experience through better notification, easier access, improved efficiency and system reliability. The expectation for systems to be integrated and intelligent is growing, and these systems can only be developed by experienced practitioners willing to collaborate and share their skills.